# Put the stale bread slices into the bowl, and add egg, grated onion and milk to soften them. # Add ground meat, cumin, black pepper, salt, finely sliced parsley, knead for 10 minutes, and refrigerate this mixture. # Peel the aubergines, and rest them in salt water to remove its sour taste. # Slit each aubergine into 5 pieces, fry in hot water. 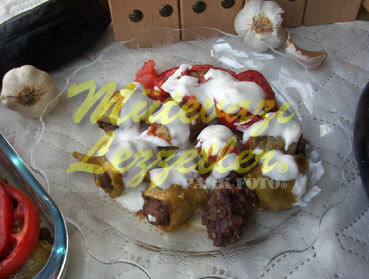 # Place the fried and cooled meatballs near the cool aubergine slices, roll the aubergine slice around the meatballs. # Place these packs on the medium oven tray, and place the peeled tomato circles on the top. # Cook it in the oven which is preheated to 374 F, until the colour of the tomato slices changes. Place on the service plates, and pour the mixture of the pounded garlic and yogurt all over. Note: you can roast the aubergines and grill the meatballs for making the meal more healthful. In that case, you should grease the tray with 1/3 cup of vegetable oil.